Scientists know surprisingly little about a salmon’s life outside of their freshwater and nearshore habitats, but an ambitious study is attempting to change that. The International Year of the Salmon put together an expedition with 21 international scientists in the Gulf of Alaska, all in the hopes of understanding more about the mysterious lives salmon lead in the open ocean. 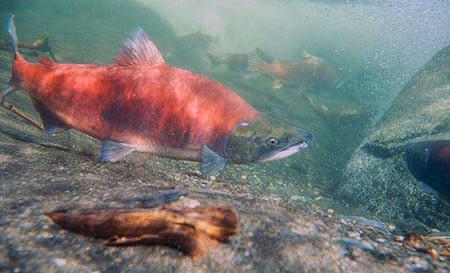 The International Year of the Salmon is a quasi-international organization aimed at bringing attention to all five species of Pacific salmon as warming ocean temperatures affect their survival at sea. “We will set the conditions that we need for salmon and people to be resilient as we're dealing with this change in climate,” Mark Saunders explained. Saunders works for the North Pacific Anadromous Fish Commission and he helped establish the International Year of the Salmon initiative. The project is brining scientists, fishery managers and policy makers together from Japan, Russia, the U.S. and Canada in the hopes of making salmon management in the Pacific Ocean an international effort. “We're looking for those projects that we believe are transformational and then going after the funding to do it,” Saunders added. One of the projects was a five-week expedition that acted as a first-of-its-kind stock survey for salmon in the Gulf of Alaska. “The central Gulf of Alaska is a nexus of where salmon, almost all of the species, utilize in the winter that environment, and so the question was what are the mechanisms that are affecting abundance?” he said. By abundance, Saunders means an estimate of how many salmon are swimming in the ocean. The expedition ended recently in Vancouver, Canada, and the scientists onboard the ship are coming back with a wealth of material that will inform numerous studies. But Saunders said the most applicable will be at-sea abundance estimates for each species, something not currently utilized in the U.S. and Canada. There are larger questions the study may be able to start answering such as at-sea competition between hatchery and wild fish. One of the expedition members, Charlie Waters, is a research fish biologist with the National Oceanic and Atmospheric Administration. He said studying salmon toward the tail end of winter will allow researchers to understand how species are surviving during this time of low food abundance. “If salmon don't eat enough before they hit this winter period, they may not have enough energy stores to survive these harsh winter conditions,” Waters said. He will use ear bones from both the chum and pink salmon he’s studying to identify whether they’re wild or hatchery origin fish. A hatchery fish’s otoliths, or ear bones, are marked by changing water temperatures while in incubators at hatchery facilities. Those marks act much like a barcode, specifically identifying which hatchery facility they came from. Using other tissue samples, Waters can then assess whether the fish are starving, and if so, will they die? He also took stock of available food sources. That will help answer whether large releases of hatchery pinks and chums from Pacific Rim countries are impacting wild fish in the open ocean. “For hatchery and wild chum salmon for example, you can estimate the degree to which they’re competing for food resources. But then you can also compare different species,” Waters added. Still, he said this is only a one-year snapshot and that conditions in the Gulf change year to year. Both Waters and Saunders hope international surveys of the Gulf and the broader Pacific Ocean will become an annual occurrence. However, there is already talk of another expedition in the coming years.